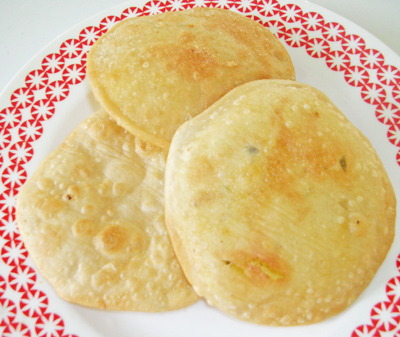 Dal puri is basically flat bread stuffed with lentil and spices. It is a very popular snack in Bangladesh and India. Usually red lentil is used for this recipe. Some people like to use dry chilli for this but my personal choice is green chilli (if possible Bombay chilli). If anyone wants to use dry chilli, dry chilli fry first and then make a flake. Wash the lentil and cook the lentil with ¾ cup water, green chilli, turmeric, onion, ginger, garlic and salt. Sometimes you need more water to cook the lentil. When water gets dry, take off from hot plate and mix coriander and Bombay chilli. Make a mash keep it aside. First dissolve the salt with water and mix the flour and oil. Knead the dough 4 minutes (even you can use food processer for that). Cover the dough and let it set for 10-15 minutes. Divide the dough and lentil stuffing into 10 equal sizes. Roll the dough into 3” diameter bread and place the lentil ball in the middle. Seal the edge by pulling the edges of rolled dough together to make a ball. In this way make all 10 balls. Let them sit 5 minutes before rolling them. Heat the frying pan on medium heat and pour the oil. Roll the balls. It will be easier if you roll the ball in dry flour. Carefully press the ball on seal side and keep it on the topside while rolling. Make it 4’ diameter. Check the oil to put a little piece of dough in the oil if it sizzles and comes up slowly .It means the oil is ready. Place the puri in the oil and fry it until golden brown on both sides. Serve the puris with a sprinkle of black salt (bit lobon). So many thanks for sharing such a lovely recipe. Really favorite in Bangladesh. My children loves it very much. But for long time I did not try to make some. I will try to following your recipe. Excellent blog, please keep it up. Waste the lentil and cook the lentil with ¾ cup water, green chilli, turmeric, onion, ginger, garlic and salt. Sometimes you need more water to cook the lentil. When water gets dry, take off from hot plate and mix coriander and Bombay chilli. Make a mask keep it aside. And in the last line :Make a mask keep it aside.I did not understand this. Sorry typing error. last word will be mash. Thanks. Thanks Mir for your word. how much water to add in the dough? Great recipe. Whenever i make, it turns out in great taste, crispy and exactly like our bangladeshi “Cha” stall’s puri. My husband is very fond of this puri. Thanks a lot to give us (who are abroad) this deshi taste. May Allah SWT bless you with all the happiness.